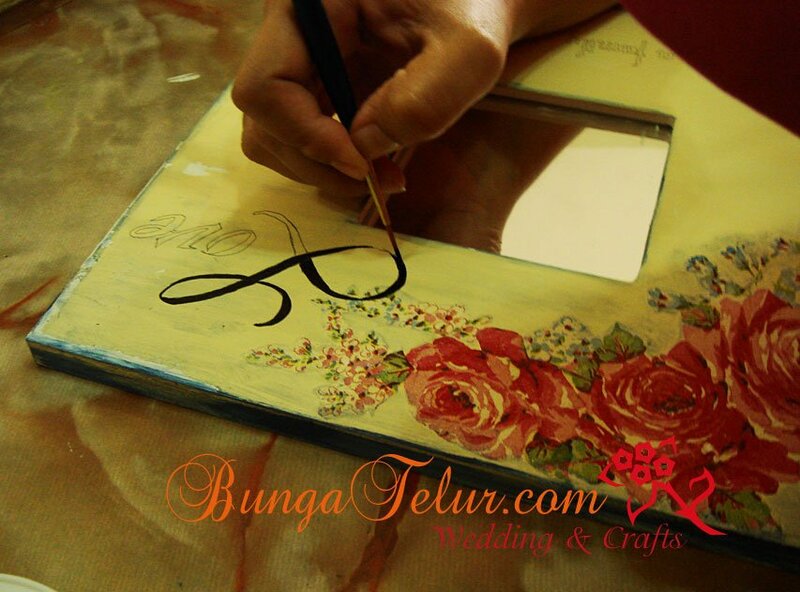 Kelas asas decoupage menggunakan tisu/serviette akan diadakan pada 1 December 2013, hari Ahad jam 2 petang di Puchong. Jangka masa kelas adalah 2 jam 30 minit. Untuk kelas ini yuran adalah RM60. Semua bahan yang akan digunakan semasa kelas berlangsung akan disediakan. Selain teknik mengecat permukaan yang akan di tampal, teknik tambahan seperti shading dan menulis wording turut di ajar. Jika berminat untuk belajar sila hubungi melalui email [email protected] /sms/whatsapp 012.648.2121. Kelas terhad kepada 6 orang peserta. 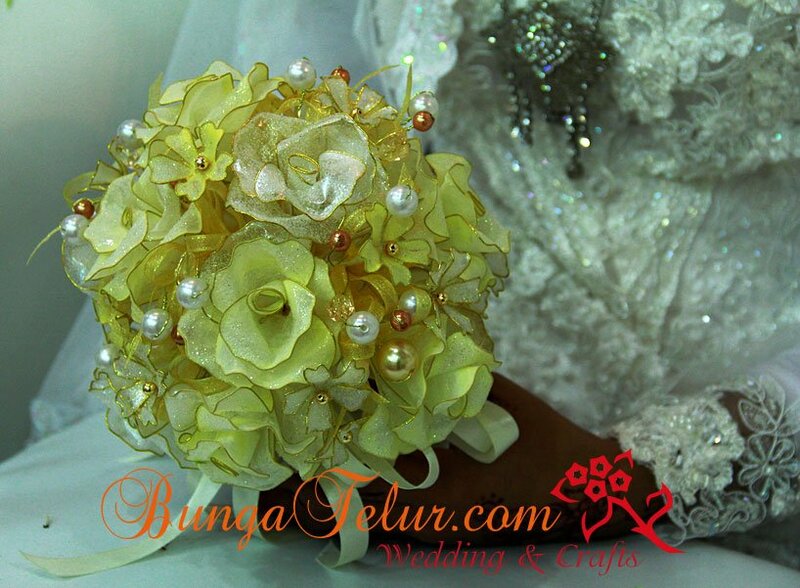 A customer saw the picture of bunga dip hand bouquet I made a few months ago for a bride. 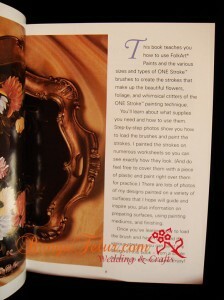 She requested the bouquet to be made into a topiary arrangement. 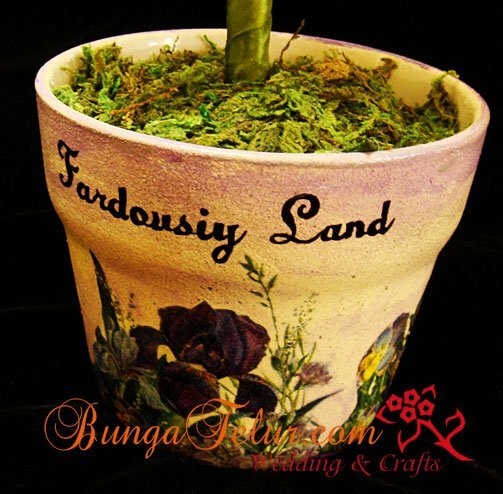 Since I’ve never made a topiary from bunga dip before, I thought I should give it a try. 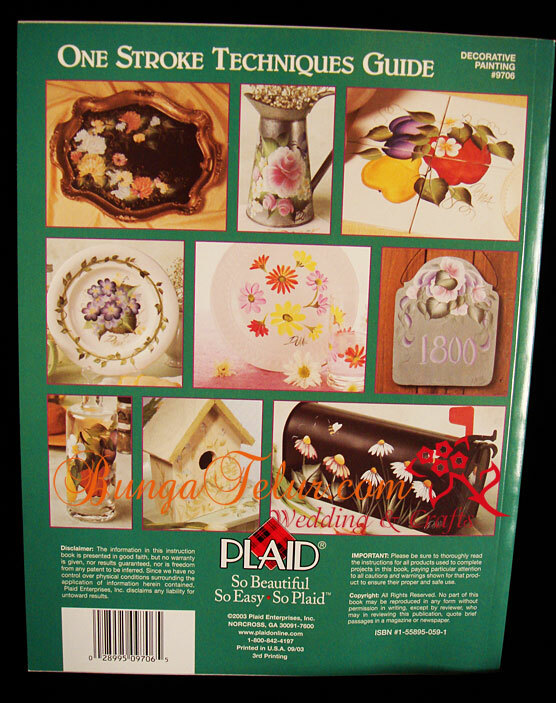 The flower pot has been decorated with decoupage technique. I put small stones inside the pot and pour a mixture of plaster of paris and let it harden. That way it won’t topple easily. 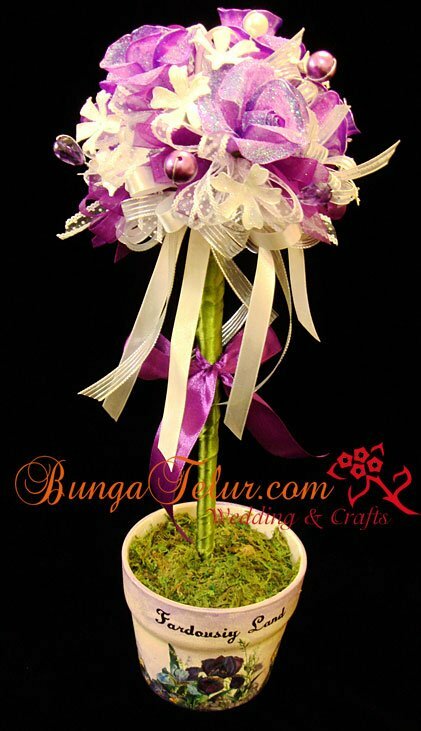 For the topiary part, I assembled each piece of bunga dip and tied it to the tree stalk. It is quite different than making topiary with artificial plastic flowers whereby I can just chuck the flower into the floral foam. The dried green moss was put on top of the flower pot to cover up the stones and plaster of paris. 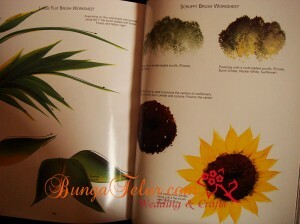 Overall it’s a good experience for me to do this type of topiary, combining my skills in making bunga dip and decoupage. 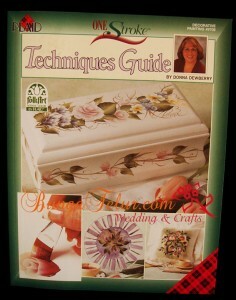 A client collected her decoupage order last week. This time I made decoupage on MDF board shaped like a chopping board. 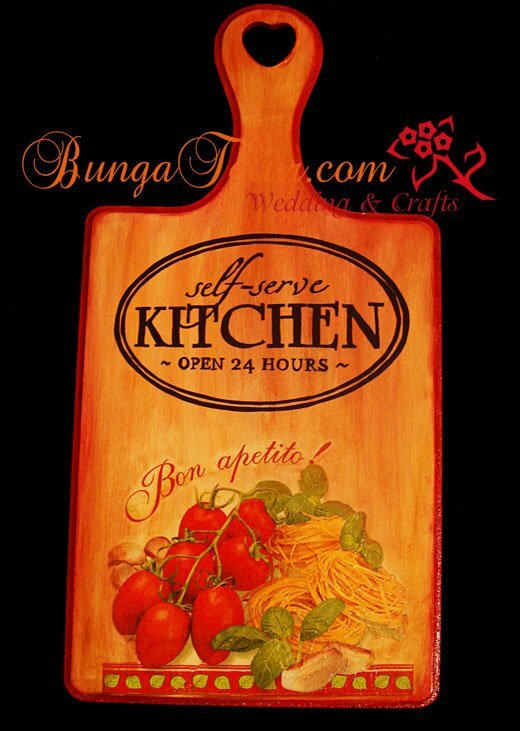 I used a napkin with pasta and tomato motif since the client loves bright colors for her kitchen decoration. 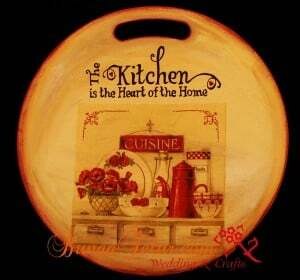 Hope it will help brighten the self-serve kitchen. Someone ordered this door hanger for her guests room. 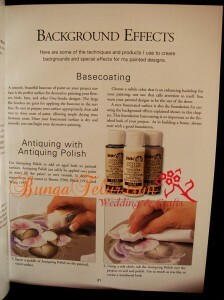 I decided to try spattering technique on the background before I glued the decoupage napkin on the surface. Next time I think I will use dry spattering technique instead of wetting the toothbrush before dipping into the acrylic paint. For the other side of the door hanger I didn’t write any wording. I have been planning to use this vibrant orange poppy motif for some time and glad I managed to use it on this project. 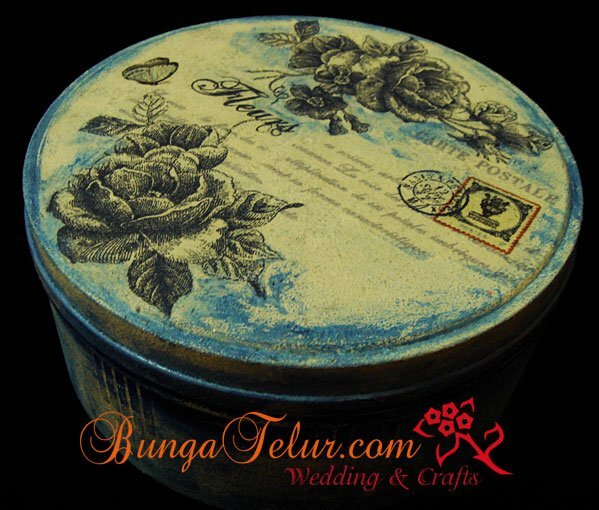 If anyone is interested to learn the basic of decoupage using napkin/serviette, there will be class this 21st April, Sunday at 2pm. 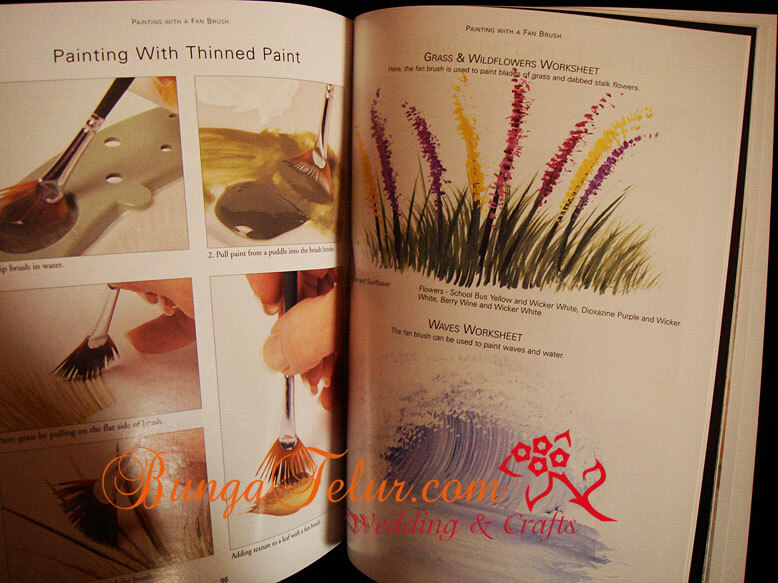 The fees are RM60 inclusive of all materials needed for the class. Please contact to get more info about the class. You can email me at [email protected] or sms at 012.648.2121. I finally managed to complete the order for these bunga pahar songket during Chinese New Year holiday. I have been working non stop since Christmas to make all the necessary materials. 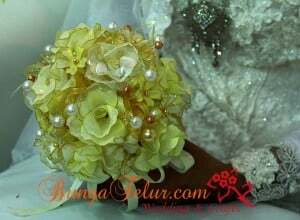 The assembling part took more time that I usually do for bunga stokin maybe because each piece has many ribbons, crystals, purple pearls and gold leaves. 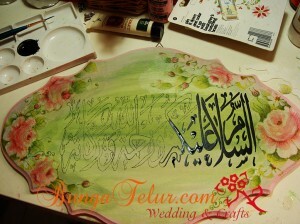 I hope the client will be happy having this at the pelamin during her wedding reception. If anyone is interested to learn decorative painting from books, this One Stroke Techniques Guide by Donna Dewberry is a good book for beginners. I’m selling this for RM45, excluded postage. I have 3 books in stock. There are 128 pages. You get to learn all the basic materials, type of paint, basic guide on how to do the basecoating, crackle effect and spattering just to name a few. The brand of the paint and medium used in this book is Plaid/ Folk Art. If you are in Kuala Lumpur, the brand is sold in Art Friend, The Gardens. 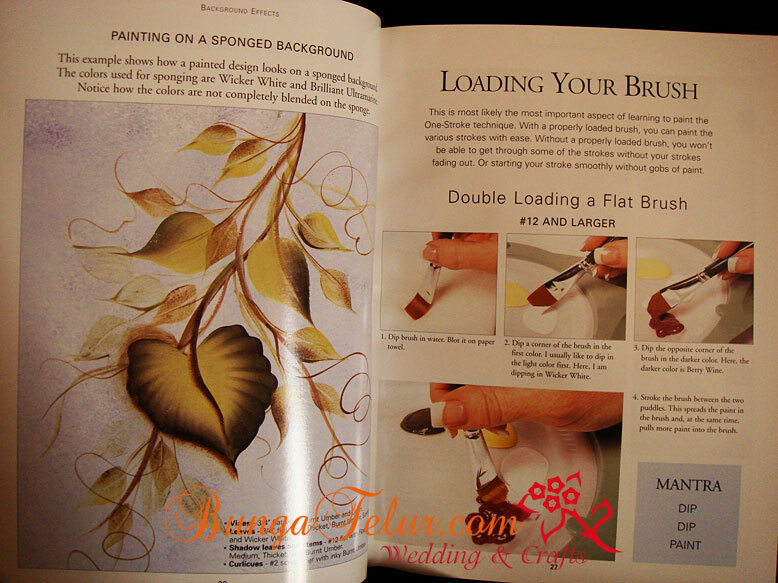 If you are a newbie to decorative painting, you will be surprised to find all kind and shape of brushes i.e scruffy, angle, flat, fan, filbert. 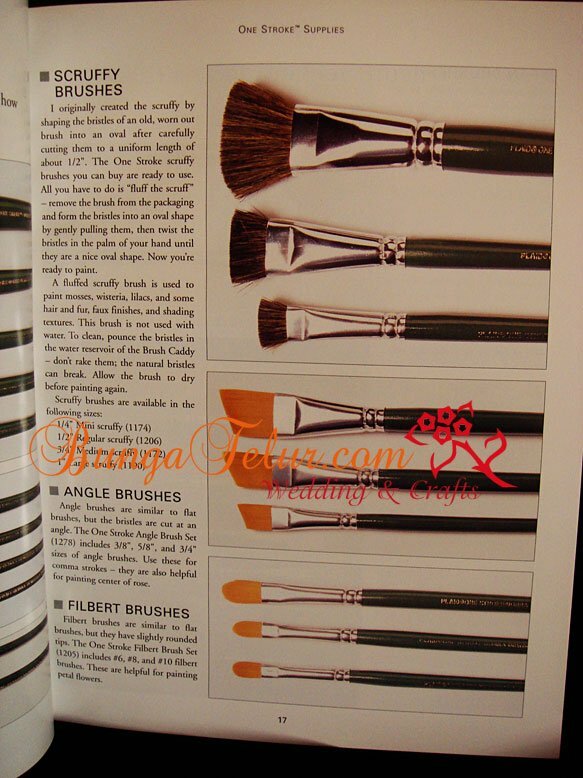 Each will have different function and usage in painting. It’s really important to basecoat the material you want to paint. To make it more interesting, there are techniques like crackle, spattering, antiquing for more effect. 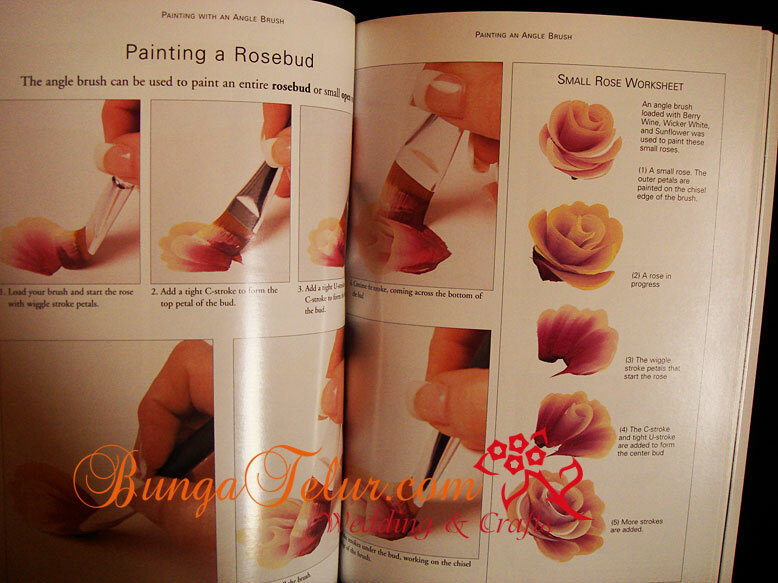 Some can be done before you start painting, and some after you have painted the design. 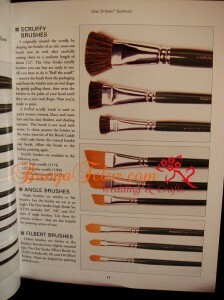 To start the one stroke techniques, you have to know how to load your brush. There are pictures to show each step. 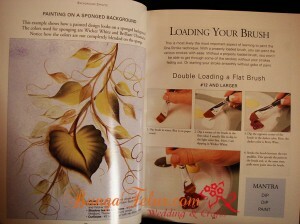 Of course with practice, you will get the feel of it and can start to paint with ease. 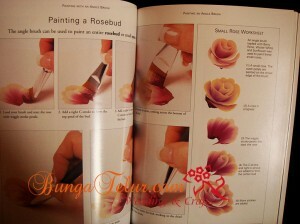 There are steps on how to paint rosebud using angle/angular brush. 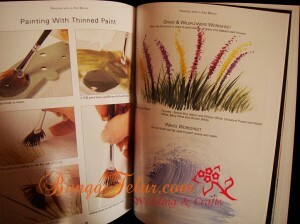 If you have been wondering how to use fan brush, check out the worksheets on painting grass and wild flowers. It can also be used to paint waves and water. 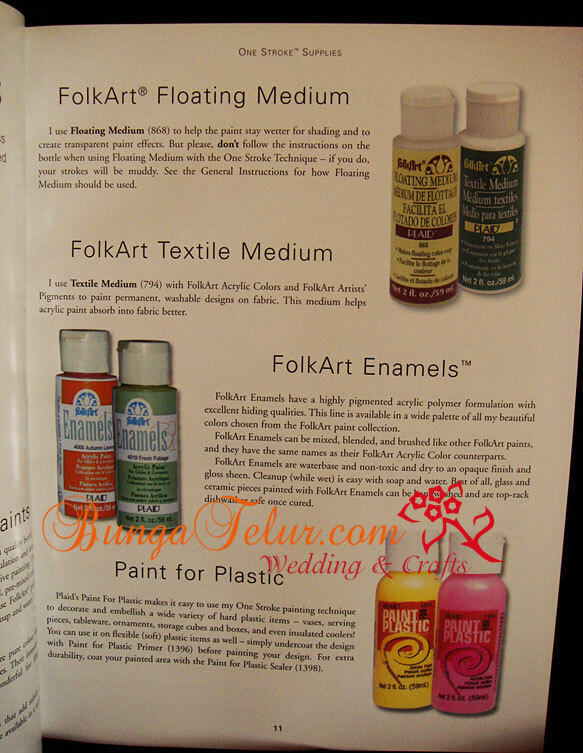 If you want to paint on fabric, there is special medium to be added into your paint. 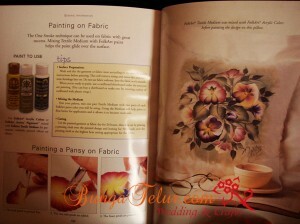 It will help the paint to glide over the fabric. There are many worksheets to practise the strokes, shown here are the one using flat brush and scruffy brush. 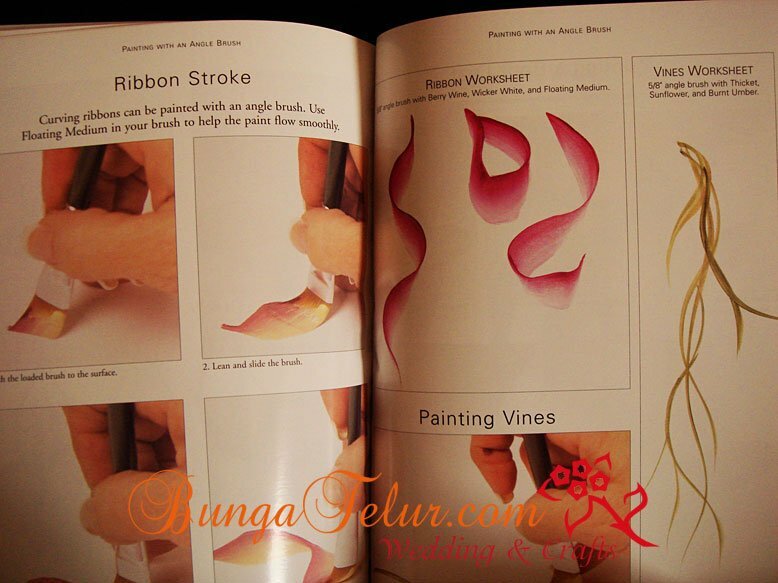 Your angle brush can also be used to make ribbon strokes and to draw vines. 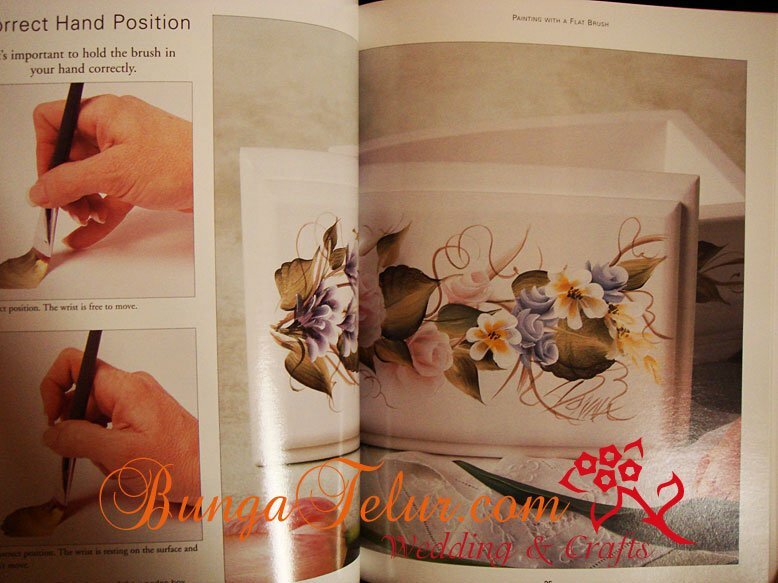 In decorative painting, it is really important for you to know how to hold the brush and position your hand. If anyone interested to get a copy of this book, kindly leave comment/email me at farah[at]bungatelur.com or sms 012.6482121. The postage and handling using poslaju/pos express will be RM7 for this book. 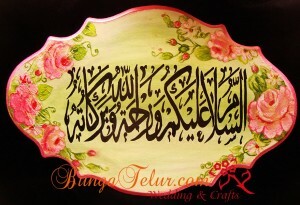 Those in Geng Decoupage have been going crazy about this pink rose napkin bought from Romantika. I managed to buy a packet and started working on it. I shaded the board with Ivory White, Pine Green and Baby Pink. Before that I painted the background in white. It looks really sweet once I have pasted the napkin. 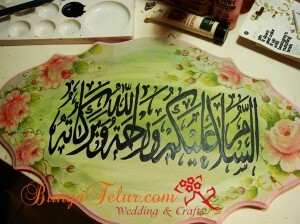 I painted the wording salam on the board since I want to give this to my SIL as her birthday present. 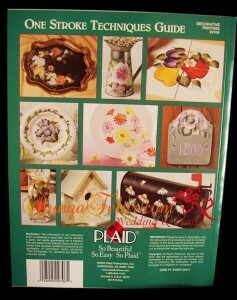 But then someone in the group told us that her decoupage product lost the color after a month being put outside. Another friend told that her customer complained about the same fading problem as well. 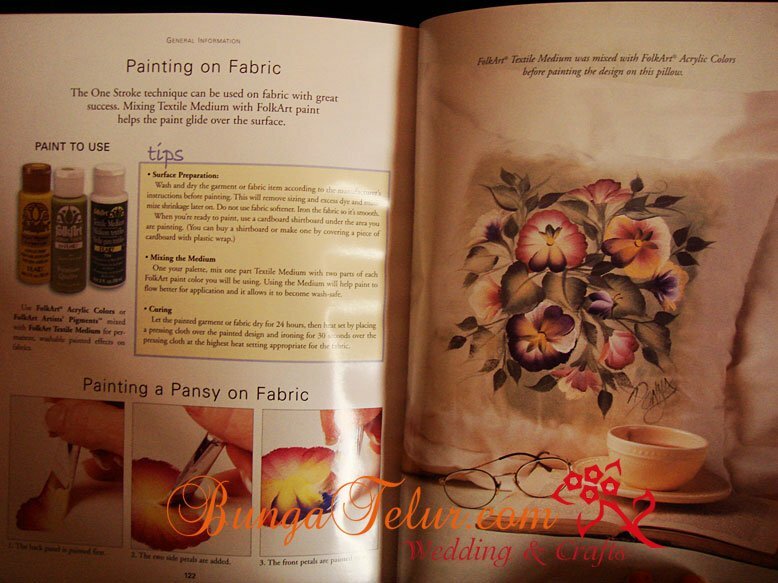 I have never encountered such problem since I usually use IHR or other high quality napkins for my decoupage work. 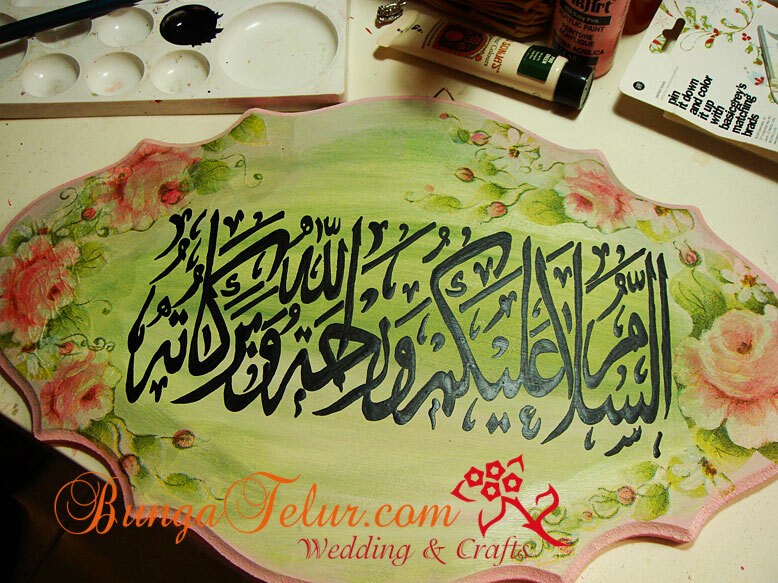 So to be safe I decided to touch up the rose and leaves motif in acrylic. It turns out to be more bright than the original color..huhu! Well, I have varnished the board and decided to take chance with it. If it still fades then I know next time just to use such napkins for indoor decoration.